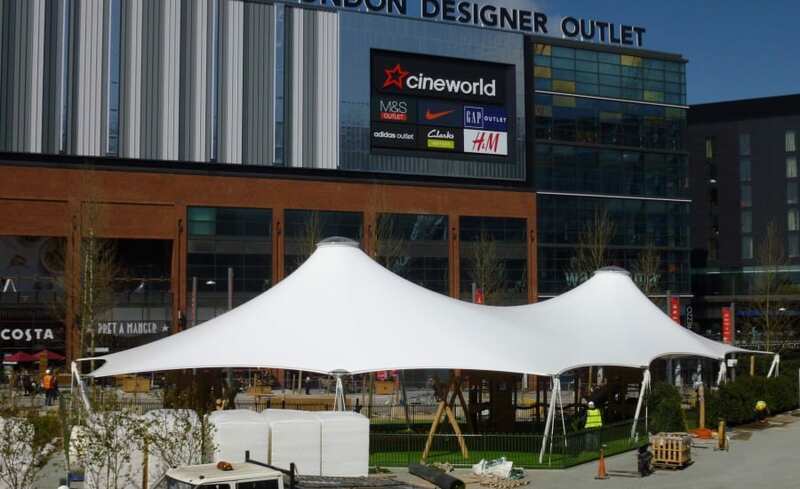 Adjacent to Wembley Stadium is a new destination: Wembley Park which includes the new London Designer Outlet Centre. The park and shopping centre are part of a grand regeneration scheme bringing designer shops, restaurants, a cinema, and outdoor play & performance space to the area. 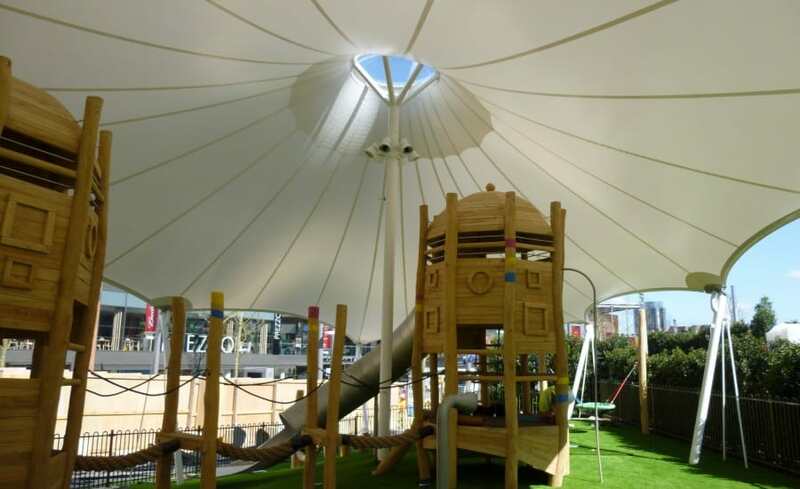 One of the highlights is the addition of a new tensile fabric canopy over a children’s play area. Architen Landrell worked with Landscape Architect, Applied Landscape Design, to help them realise their vision of an iconic tensile fabric structure that is light and airy and multi-purpose. 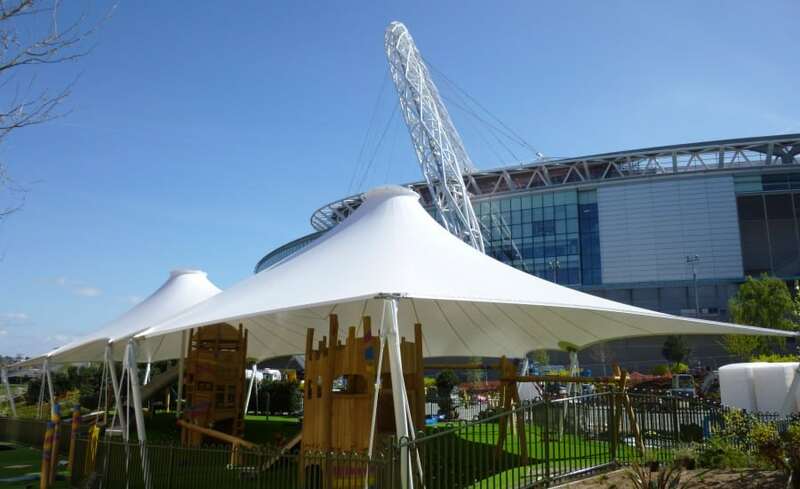 The 36m x 20m Double Conic structure is perfect for family fun, creating a covered space for children to enjoy come rain or shine, doubling as an outdoor performance space. 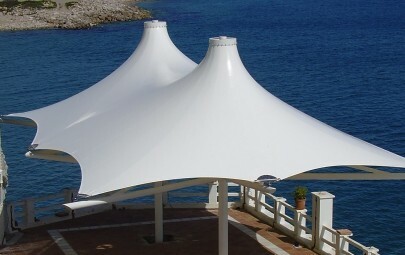 Conic structures, also known as umbrellas, are very popular structures because their design offers an abundance of all-weather protection. 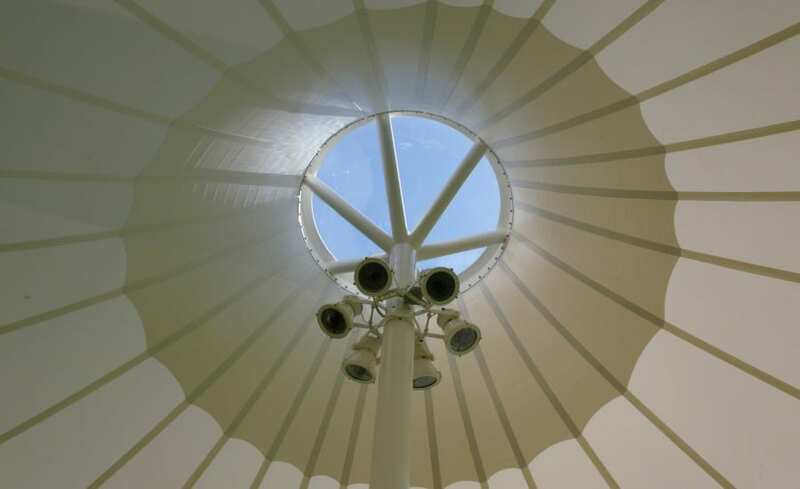 The headrings of a Conic structure are typically steel; however, in the case of Wembley Park, polycarbonate roof light domes were installed to let in more natural sunlight. 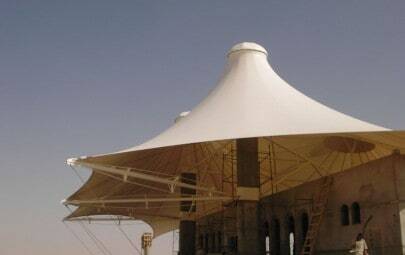 To manage rainwater runoff, integrated drainage was added to the fabric structure. Fabric gutters were installed around the perimeter of the canopy directing rainwater to the corners. Rainwater travels through flexpipes connected to membrane plates and down through galvanised steel perimeter posts, then into the underground drainage system. 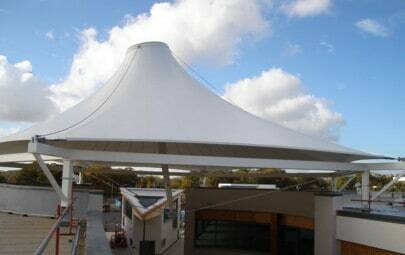 This was the first time Architen Landrell have used Nano Fabric Technology in a tensile fabric structure. This exciting new type of PVC Coated Polyester is truly inspired by nature (the leaves of a Lotus plant to be exact). The fabric is designed to self-clean in the rain. 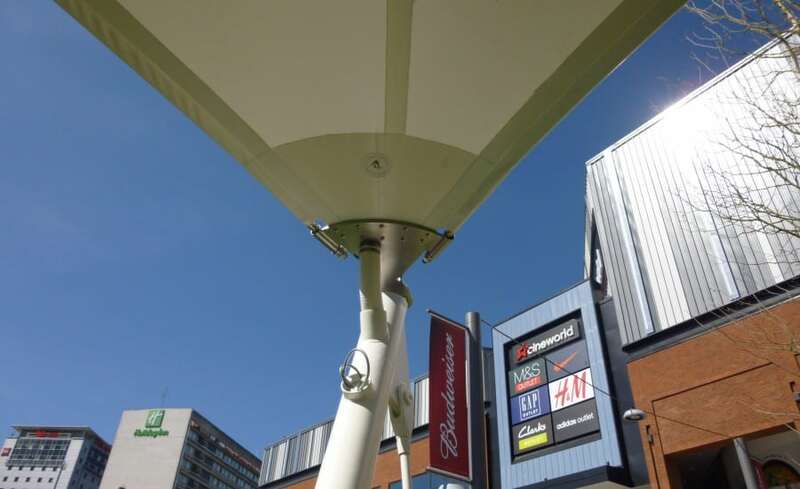 Rather than rain wetting the surface of the canopy, it beads up creating large sphere droplets that travel down the structure removing dirt – this reduces the expense of maintenance. Did you know: looking to nature for design inspiration in design is known as Biomimicry. Lifting around 700m2 of fabric is no easy task. Our Site Operatives used a 40 Tonne crane to lift the single layer of PVC Coated Polyester fabric, installing it onto the framework. We used a particularly interesting installation and tensioning method called sandpots. At the base of the two central pushup masts are steel sandpots in the ground (below finished floor level). The steel masts were inserted into these pots and as we jacked the most up, we then filled the space beneath the mast with sand. As the sand filled the pot, it created a surface for the steel masts to stand on. This pushed the whole canopy up adding the exact right amount of tension to the structure. This method allows us to go back and easily retension the canopy.